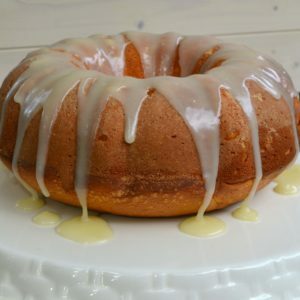 Lemon Pound Cake is made with fresh, squeeze lemon juice and zest for a cake that’s like a taste of summer with every bite. If you love classic pound cake, then you’ll be head over heels for this citrus loaded version! Happy Friday, friends! The sun is shinning and the weekend is finally here. I thought I’d bring a few rays of sunshine into my house with a little something sweet for my guys. 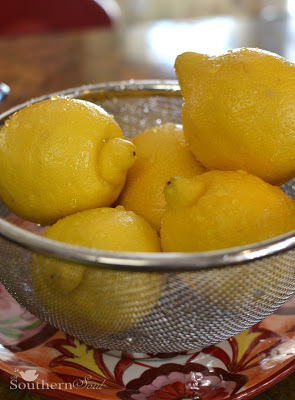 It was an easy choice…pound cake plus lemons, what a great combination. I hope you all had a great week and have some fun things planned for the weekend. We do, and we just might start dinner tonight with cake! Not a bad idea, right? 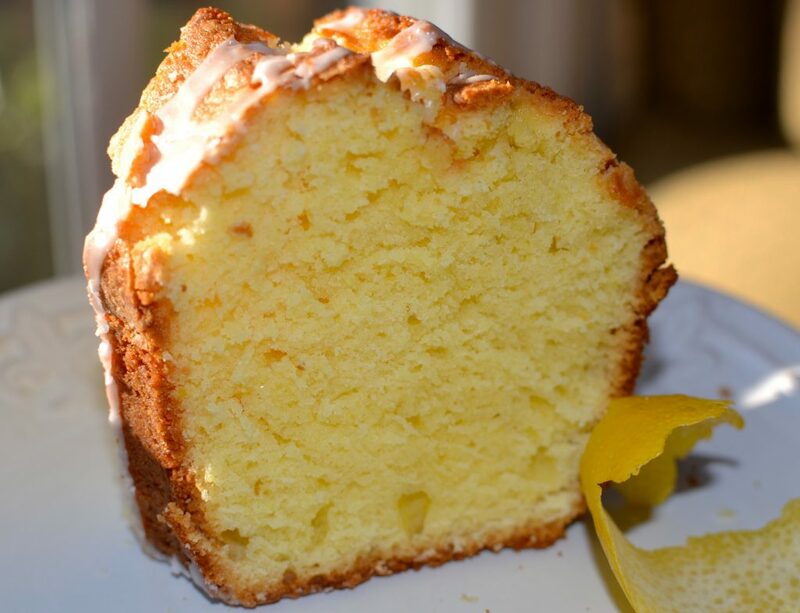 With a bright citrus taste, this lemon pound cake is yummy and easy to make. Grease tube or bundt pan. Dust pan with flour; tap out excess. Sift flour, baking soda and salt into medium bowl. Using electric mixer, beat butter in large bowl at medium speed until fluffy. Add eggs 1 at a time, beating just until combined after each egg is added. Using rubber spatula, mix in dry ingredients. Pour batter to prepared pan - batter will be thick. Bake cake until tester inserted near center comes out clean, about 1 hour 20 minutes. Let cake cool in pan on rack 15 minutes. 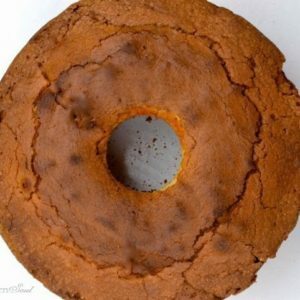 Cut around cake in pan. Turn out cake. Carefully turn cake right side up on rack and cool completely. 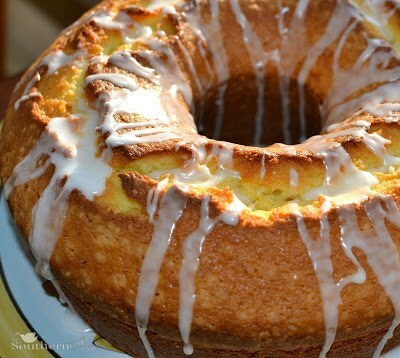 For an extra touch - drizzle glaze made of 1 cup confectioners sugar and 2-3 tablespoons of fresh lemon juice over cake. Make sure to PIN this recipe HERE to SAVE! Thanks, friend! 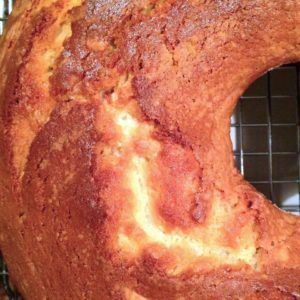 With lemons, and sour cream, this pound cake is always a winner. 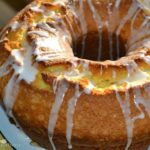 Donya, I adore lemon poundcake, and this looks like a must-try recipe! PINNING! Your photography is gorgeous. Thanks for your sweet words, Joy! I am glad you stopped by and are now following. More good things are on the way. Have a great week. Thanks for a great catch on the temp! 325 degrees…I hope you come back and share your information so we can keep in touch. Awesome recipe. Everyone love this. Thank you so choosing this recipe! Even more so that you are taking it to an event. Sounds like you are a very, very good baker. Please let me know how your cakes turn out. Have a wonderful Palm Sunday! Just made the cake… It has risen quite high. About a half inch about the bundt pan, Lol! I followed the directions exactly except that I added a tiny bit of Lemon Extract in the mix just to give it more of a lemony (don't know if thats a word) kick. I'm just hoping that I can get it out of the pan easily. I'll be back to tell you how it tastes! I keep looking for my granny's version and this sounds like it. Can't wait to try it. Thanks ~ hope you'll come back and let me know how we can stay connected. Visit me on Google+ and Facebook! Made it today, has wonderful texture and moisture, Just glazed it and sampled a peice…. I did two 4x 8 loaf pans that the bread exploded out of, so its 5×9 pans next time… I think Ive found a pound cake recipe FINALLY that I love, I just need to get more lemon flavor in there (I couldnt taste it at all) , so I will be adding some lemon extract next time as well…. I absolutely love lemon cake. We do a lemon meringue at our bakery. Have you ever tried using lemon oil instead of just juice? It can help remove the bitter taste that you sometimes get with juice. Thank you for the lovely recipe! Lovely lovely recipe. Mouth-watering! Thanks so much for sharing with us at Weekend Potluck. And thanks for the link back too. WOW! 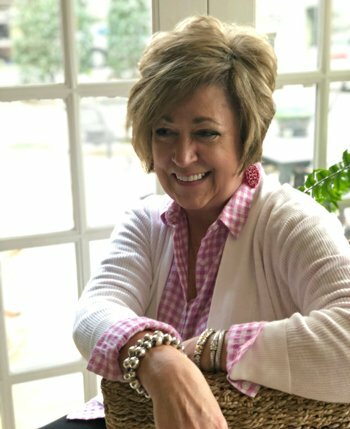 Thanks Marsha for the kind words. I love all the recipes on Weekend Potluck and am honored to be a part of the group. Girl, you had me at lemon! 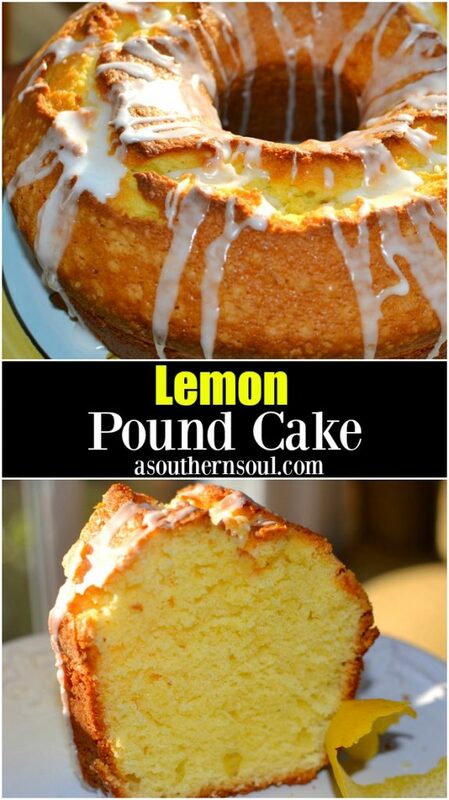 Lemon pound cakes are my favorite! Thanks so much for sharing at Weekend Potluck. We always love when you share your delicious dishes. Make sure you come back on Friday! Thanks for sharing your awesome Lemon Pound Cake recipe at Weekend Potluck, Donya! Such a great share. We hope to see you at the party tomorrow. Cheers! You are so welcome. What a great event every week with lots of great food and ideas. Thanks so much! WOW! Thank you so much for sharing. You’ve made my day! Thank you so much for your kind words! Wow. I am glowing right now, Kate. I am so happy you stopped by. I just made this and t is in the oven. I was reading the recipe over for instructions and realized i did not put the sour cream in ?. Did I just mess this cake up? Well…there’s gonna be a problem with moisture. The cake will be dry most likely. Let me know what happens!! Lemon is one of my favorites! 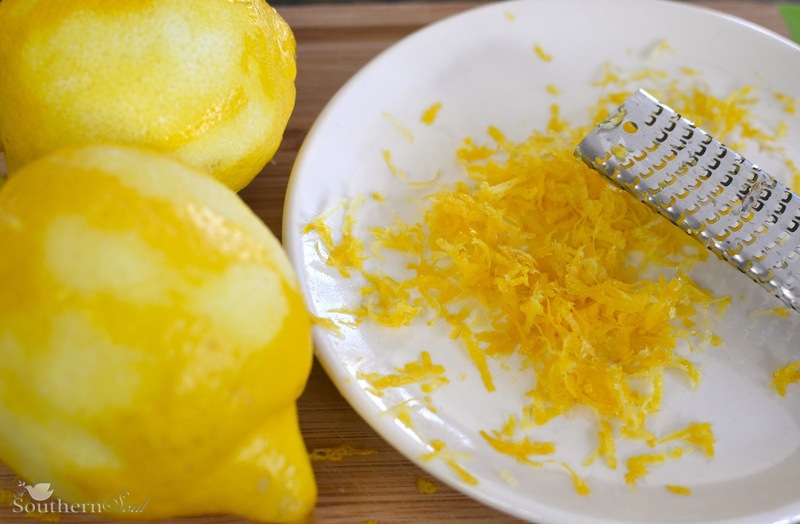 Can’t wait to share this recipe with a friend who loves lemons as much as I do! Awesome Stacey! Thanks for sharing and stopping by. Lemon lovers unite! This looks so delicious. I love lemon! If it’s lemon we love it too. Thanks for stopping by. This pound cake looks delicious ? Hey Marilyn. I’m thinking if you are going to add the extract and the fresh juice, maybe start with a 1/2 teaspoon of lemon extract and cut the juice down to 1/4 cup. Hope that helps.